First bee of the year. Glad I planted those crocus bulbs. Camera phone photo. Have you spotted any bees in your garden yet? I saw a beautiful healthy frog by the pond today. I was so pleased as last year a number of them were diseased. Hopefully there will be frogspawn soon. These camera phones take some fantastic photos. The bees have been busy here on the sunny days. Thank you Brian. Lost more bees today and it’s 10 degrees and sunny. Hurray! What a fantastic photo Karen. And yes I was accompanied by the buzz of a bumble bee in my sunny garden yesterday. He/she was especially interested in the flowers of the Corsican hellebore. Also I saw a pair of frogs mating in my pond a few weeks ago. No spawn yet, could it have been eaten already by the newts who are now swimming? Thank you. The huge bumble bees are out today too. Such a wonderful, heart-sing sound. Saw a frog last night. Was pleased it looked so healthy as last year we had some that were diseased. Fingers crossed for spawn this year. Too cold for much insect or bee activity my end of the universe. Lovely detail gained with the phone camera picture. thank you. When does it warm up where you are? Usually, warming up, suitable for planting, is about six weeks later than most of everywhere. Bulbs also come out of hibernation and flower about the same time. Thank you Mike. The huge bumble bees were buzzing around my bedroom window this morning. A wonderful sound to wake up to. There are usually honey bees on the Rosemary flowers when it’s sunny and that’s been flowering since last November. Carpenter bees are always around all year, even on quite cold days. This year I’m making a proper effort to learn all the different varieties of bees that visit /live in my garden. I can’t believe that until a few years ago, I thought there were only two or three kinds. The garden’s full of them today. It’s sunny and 10 degrees. Yay! I have to admit I get quite excited at this time of the year. I’m a bit like a little kid when it comes to Spring. Oh look, the first bee, the first butterfly, the first dragonfly, the first chiifchaff, the first swallow, the first willow warbler. I do like Spring! Me too. Just seen the first frog in the pond, and there’s a great crested newt out of hibernation too! All the daffodils popped open yesterday, and my peach mini-potted orchard is flowering too. J > Looks to me like it is gathering nectar. The early spring bulbs are unsual for producing nectar at low temperatures. 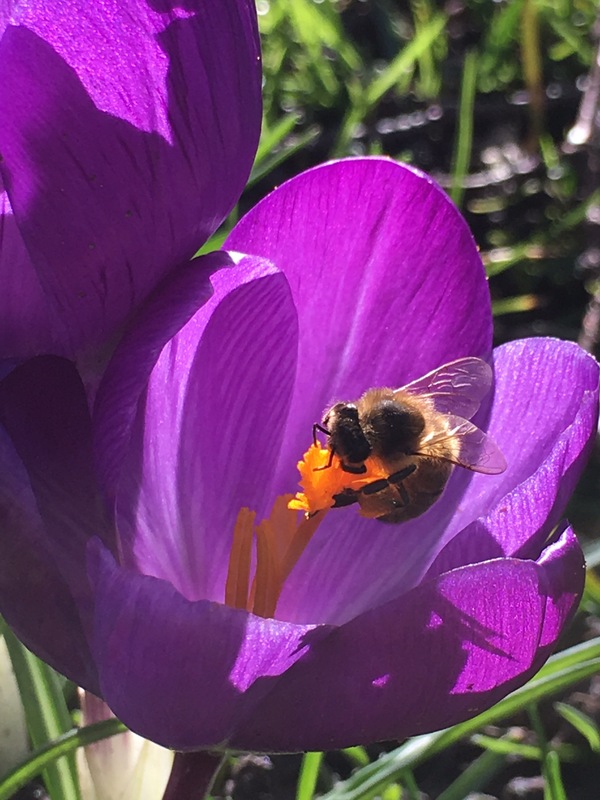 The nectar will help the bees restock the larder to last through until spring really gets going, when pollen too will be available – which is absolutely essential for producing and raising brood!